“How low will they (the Guardian )go? Asks the Zionist watchdog. 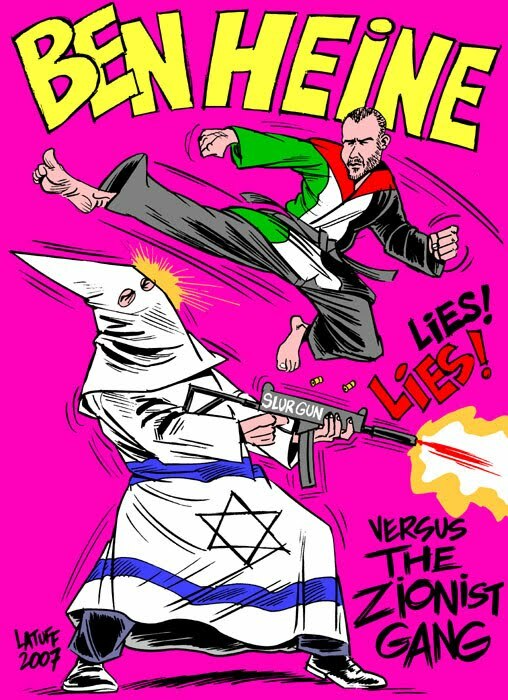 The Jewish site claims that much of Latuff’s work “expresses anti-Semitic themes. Some of his caricatures seem to suggest that Israel is a unique and immutable evil in the world.” I am afraid to disappoint the Zionist watchdog; the Jewish State is uniquely evil, and this fact has been exposed numerous times in the last years by UN fact finding missions. 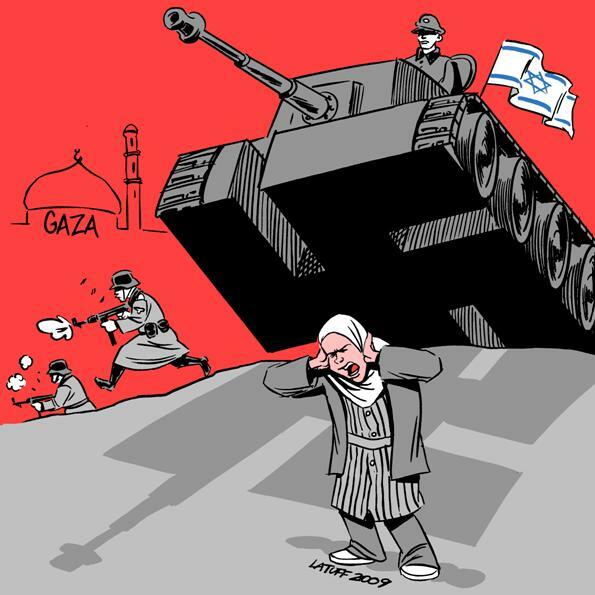 The Zionist blog claims that Latuff’s work “includes imagery frequently suggesting a moral equivalence between Israel and Nazi Germany – and he has explicitly acknowledged that this is indeed his political view.” Again this is far from being a revelation. We all see equivalence between the ‘Jews only State’ and Nazi Germany. 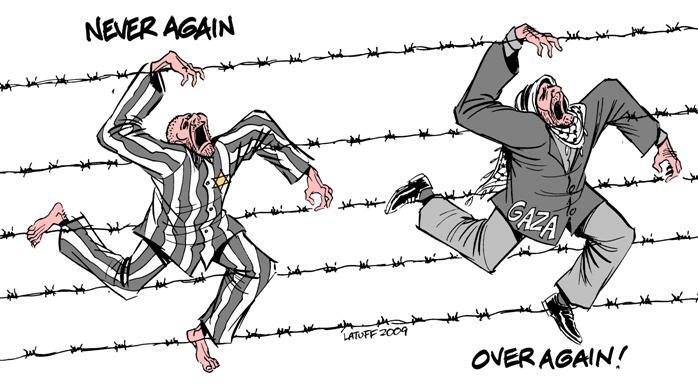 The above Latuff cartoon was published by Indymedia on Holocaust Remembrance Day. Indeed the most appropriate way to criticise the transformation of Palestine into a set of isolated concentration camps. The image above makes sure there is no doubt that the Jewish state has morphed into the new Nazi Germany by showing the tracks of the Israeli tank shaped like swastikas. Not many people realise that Zionism actually predates Nazism. 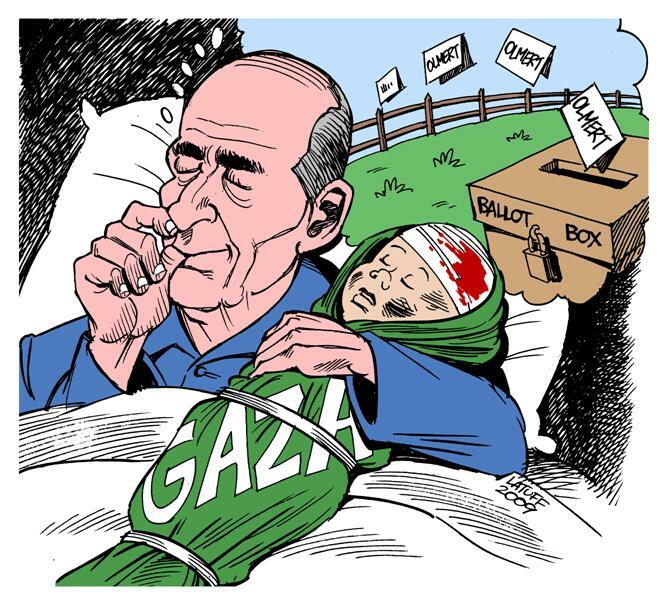 The cartoon above conveys the former Israeli prime minister Ehud Olmert cradling a dead Palestinian baby. It suggests that, not only do Israeli leaders intentionally kill Palestinian children, but also that such child murder is popular among the Israeli public and helps Israeli politicians get elected. 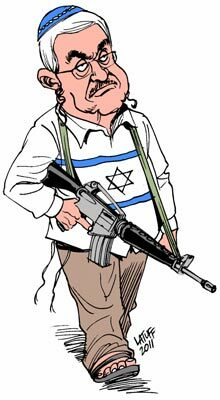 Bearing in mind that 94% of the Israeli Jewish population supported IDF murderous tactics along Operation Cast Lead, Latuff seems to be overwhelmingly realistic. This cartoon, comparing Zionism to the Ku Klux Klan. Indeed a necessary comparison considering the fact that the Jewish state is driven politically and spiritually by racist supremacist ideology. 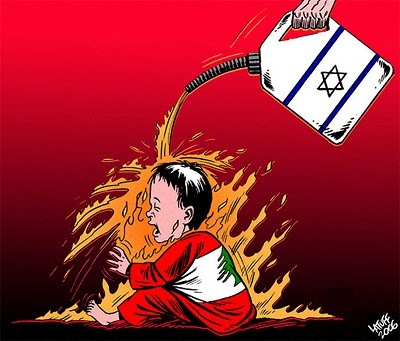 And, finally, an Israeli so evil as to douse gas on a burning Lebanese child. This cartoon is in fact prophetic. It isn't just Lebanon, it is the entire region. Let’s hope that the Guardian will soon also liberate itself of its Zionist and war advocates. We need much more Latuff and less Nick Cohen.